If you haven’t requested it already, the Tom’s of Maine sample is back. Just type in http://www.toms.samplestuff.com into your browser to visit their site and fill out the short form to request your free Tom’s of Maine sample. Allow 4-6 weeks for delivery. A little upset! Said I couldnt register for a free sample! Whats up with that?!?!? I second what Mariah said. I always joke around that I’ll always have toothpaste to eat when I eventually have more money issues than I can deal with.. 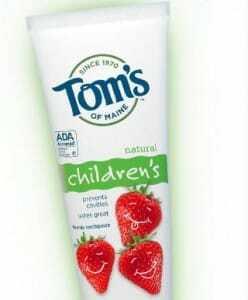 I can’t wait to let the girls try Tom’s Strawberry toothpaste. It sounds good enough they might want to eat it. My daughter has a hard time with many tooth paste BUT, She LOVES Tom’s!! 🙂 thanks for offering this sample!!! I’m always trying to find a toothpaste that my son will like. I can’t wait to try this. I would love for my Grandsons to try Tom’s toothpaste. I would like to get Free tube. I have always uaed toms to make me feel better. I tried several times to get this free sample and try your product!!! For some reason it wouldnt connect me to where i needed to be to fill out the form!! !